Welcome to The Cranky Queen! As a "thank you' to our customers, we are offering free shipping on all items purchased. Go ahead and treat yourself to some farmhouse goodness! My framed wood signs are handmade and hand painted by me (The Cranky Queen) in Waynesboro, GA. I use premium grade oak plywood. This sign has been left natural with only a sealant applied and the black pineapple is completely hand painted with no vinyl used. Each sign is framed with solid pine wood. The Cranky Queen products are always handcrafted and there may be slight variations in items, meaning no two items will be exactly the same. Due to variations in wood, each sign may have natural imperfections which add to the rustic feel of each piece. I put a whole lot of love in every piece I make and will do my best to make sure every item looks as close to the original as possible. These signs are designed to have a rustic modern farmhouse look and feel, and slight imperfections add to this look. I am obsessed with chippy paint, rustic modern farmhouse style, shiplap, and all things vintage or old. If you are my spirit person and feel the same way, these signs are for you! - This statement sign had been left natural with a polycrylic sealant applied to bring out the natural beauty of the wood. 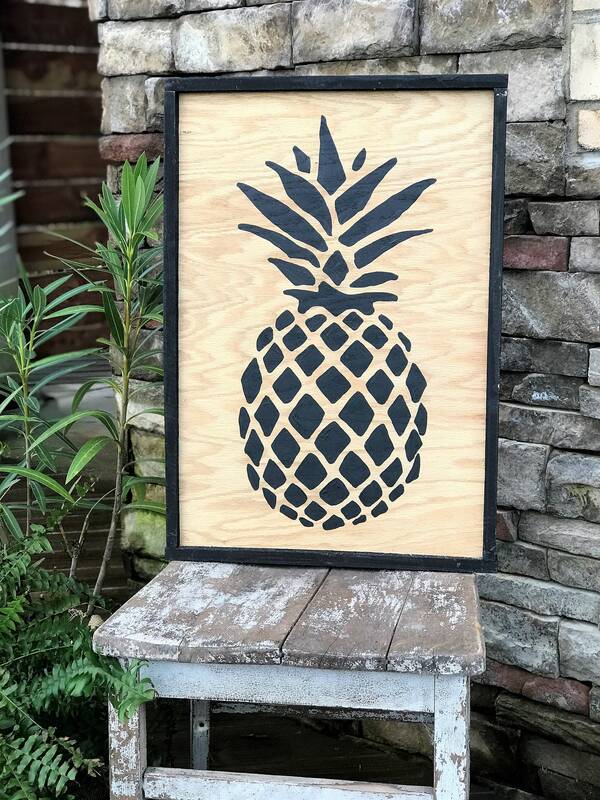 The pineapple is hand painted in black with a coordinating black frame. - Please verify your shipping address because once your order is placed, I will be unable to make changes to the address provided and cannot be held responsible for items shipped to the incorrect address listed in the original order. - Although I am new to the Etsy platform, I have been in this business since 2013. To celebrate the launch of my new Etsy shop, I am offering FREE SHIPPING on all items shipped within the continental US and kindly ask for you to return the favor by leaving a review once your receive your item! -I will do my best to get your sign shipped out within 7-10 business days and will promptly let you know if there will be any delay in processing your order. -If you have any questions, please feel free to contact me. The only way I will know that you are "feeling the love" of my little shop is by hearing from my awesome customers!